Is it only a matter of time until Katrina's second act arrives? Probably. Maybe not today, maybe not tomorrow, but someday, and maybe someday soon, a storm with as much punch -- or even a stronger one -- will come brawling up out of the Gulf. The obvious solution is to build taller, stronger levees. But while levees are critical for rebuilding low-lying New Orleans, will they be enough? Levees eventually fail, and as the federal government prepares to invest hundreds of billions in rebuilding the stricken Gulf Coast, we wonder if we will hear serious, large-scale plans to protect and restore the natural wetlands and barrier islands that once protected New Orleans from hurricanes. "You can't just depend on one line of defense; anyone knows that about levees," says J. David Rogers of the University of Missouri. "Barrier-island restoration obviously has some merit, will mollify the storm surge impact, but none of these things solves everything. You want sufficient redundancy in whatever approach you take." The Katrina catastrophe was an occasion for a gentle "I-told-you-so" from advocates of wetland restoration like Mark Ford of the Coalition to Restore Coastal Louisiana. "We have always said, one way or another, we will end up paying. If we don't do the restoration up front, we will pay on the back side, and that's coming true." Almost nobody is claiming that restoring the wetlands is a panacea. But the storm did prove that levees aren't the whole solution, either. As Louisiana and adjacent states prepare to rebuild, can we learn anything from other disasters and other restoration efforts? Practically next door is the scene of America's deadliest natural disaster -- the 1900 hurricane that leveled Galveston, Texas, killing at least 6,000. After Galveston was wiped clean, it could "build an 18-foot concrete seawall and raise the town 18 feet," says Rogers. "But the town was wiped out, so they could do it. New Orleans wasn't wiped out, or even close." Ground Zero in New York offers a pessimistic view of post-disaster squabbling among government, business and citizens, but the pressures and costs are much higher in New Orleans, says Kenneth Potter, a New Orleans native who now teaches engineering at the University of Wisconsin-Madison. "This can't wait for long, and people ought to be asking, 'What is the process?' Government, which is going to foot a lot of the bill, better step in. If you not do this carefully, there's going to be a lot of money siphoned off." The New Orleans area faces a frightening mix of natural, social, political and economic challenges, and the recent acrimony and finger-pointing among local, state and national governments does not augur well for harmony and cooperation in the critical and pressing decisions. Potter says the vast restoration now under way at Florida's Everglades is a "good example of bringing lots of interested groups together. ... I hope there is the same kind of transparent process here, where decisions are made with serious input." The New Orleans region, he says, "confronts a great opportunity to rebuild in thoughtful way. I hope the political process will be able to do that... . I'm very intrigued, anxious, to see what political process will be put together to chart the future." A "100-year storm" is supposed to happen only once in 100 years. But 100-year storms have become uncommonly common, and some experts say "100-year levees" aren't good enough. Left: The 100-year flood around St. Louis, as predicted by the U.S. Army Corps of Engineers' Upper Mississippi River System Flow Frequency Study. Right: The 100-year flood, as predicted by research at Southern Illinois University, is at least 3 feet higher than the Corps prediction. Most of the areas behind these levees are "are considered subject to inundation," says Nicholas Pinter of SIU, who says the rest have only marginal protection. Left: Corps of Engineers, pdf ; Right: Nicholas Pinter. If we're thinking that nature can help in the protection against hurricanes, we need to know what works, and what doesn't. 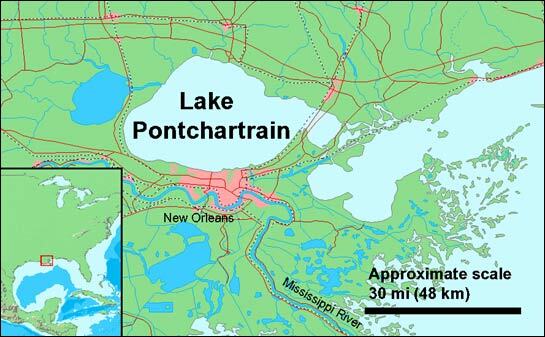 In a broad review of coastal wetland restoration, a report from Battelle Memorial Institute described more than 100 projects in Louisiana alone that use "numerous methods (e.g., water diversions using pumping stations, beneficial use of dredged material for marsh creation, and terracing)" to restore Mississippi River delta wetlands. Essentially, these projects are experiments written into the landscape, the report suggested. "The program managers readily admit that the outcomes of these projects are uncertain, and that some of their efforts have met with failure." Reflecting the central role of freshwater and sediment starvation, many projects concentrate on turning back the clock. 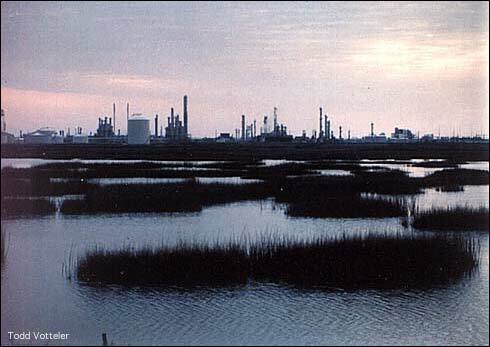 "Their basic strategy is to introduce water, nutrients, and sediment into the marshes to promote marsh growth and development." The report concluded that coastal wetland restoration must encourage experimentation, a willingness to learn from mistakes, and careful evaluations of project results. Unfortunately, when seen against the massive scale of Gulf wetland destruction, restoration data is limited, says Pinter. No existing preservation or restoration project "can reproduce the enormous magnitude of the loss or the magnitude of the restoration that would have to be undertaken. There are some very localized restorations, but they would have to ramp that up many orders of magnitude." Mark Boyer, who studied marsh management efforts that tried to stem the loss of Louisiana wetlands with levees, sluice gates and other technology, said that, despite spending up to $100,000 per hectare, many produced no net gain in wetland area, and he thinks further mistakes are likely. Speaking as a private citizen (he no longer studies coastal wetlands), he says, "There is going to be a lot of money thrown at the problem. If we can use the past as a predictor of the future, there is going to be a lot spent for nothing, or very little benefit. ... The problem is so complex, there are so many factors coming into play, that a solution is not going to be the solution." At present, Ford estimates that $50 to $60 million is being spent annually on wetland restoration in Louisiana, which, in the face of the guesstimated $100+ billion price tag for cleanup in Louisiana and Mississippi, sounds penny wise, pound foolish. Why hasn't more money been spent? Gerald Galloway, who spent his career dealing with floods and levees on the Upper Mississippi River, says "People have been talking about that for 10 years, 15 years," but the priority was low. "People said 'Ho hum, other things are more important to do.' At each level where this discussion was to be had, there is plenty of responsibility to share. The locals wanted locks on the canals, or other projects in their state that seemed more important. They hadn't been hit by category 3 storm, so what could a category 4 or 5 do? Now we know. In terms of inaction in the face of predictable catastrophe, we hear an eerie parallel from California, where 1,100 miles of levees around the Sacramento-San Joaquin Delta may be in danger of collapse. Jeffrey Mount, a professor of geology at the University of California at Davis, calculates that the odds are two in three that these levees will collapse within the next 50 years. And while few people now live inside the levees, he says 100,000 houses have been proposed near Sacramento, behind a questionable levee. Even if those houses are not built, the levees are protecting farmland -- and many of the channels that convey water to the millions who live in the desert that is southern California. "Twenty-two million people in California depend entirely or in part on the delta for their supply of drinking water," Mount says. While the Sacramento area is threatened by spring floods from snow runoff rather than hurricanes, Mount insists the root causes nonetheless echo the New Orleans situation. "Subsidence, over application of levees, attempts to engineer a variety of ecosystem services that are in conflict with each other." In New Orleans, as in the Sacramento delta, shipping plays a major role, he adds. "They leveed off the marshes, built up the ship channels, because they wanted farms and ship transportation. They killed off the marshes, and they are subsiding, and the net result is the same as in the Mississippi delta." In New Orleans, the natural fact is that the city is sinking, sea level is rising, and storms are practically atop the city before they start to abate. As hurricane seasons come and go, New Orleans is in a tough spot. Rebuilding levees, restoring wetlands, and refining faulty evacuation plans may all help, but, "New Orleans has been fighting a losing battle against its setting, and is at particular risk of river and coastal flooding, due to long-term subsidence," says Nicholas Pinter. Speaking as a geologist, he wonders how much sense it makes to rebuild New Orleans at the historic location. "It is fighting a losing battle, and the measures that would give it some long-term advantage in this battle, like periodically raising the city, are so expensive." That's sacrilege to anybody who loves cafe au lait, blues, jazz, Creole cooking or the irreplaceable cultural mix of South Louisiana. And if we had to hazard a bet, we'd figure that New Orleans will be rebuilt right where it always was, between Lake Pontchartrain and the Mississippi River, just north of the Gulf of Mexico, in the crosshairs of an unknowable number of hurricanes. And while Katrina was grim, New Orleans could face something even worse, as Pinter observes from his safe location (like The Why Files) far upriver. "Katrina was not New Orleans's perfect storm, it was category 4, not 5, it was not a direct hit, but a glancing blow. We had a near miss with Ivan, one year ago, a near miss with Georges in 1998. Just the last few years suggest that the probability of one of these strikes is greater than we have been lead to expect." Storm on over to our bibliography.